Fertilizer spikes can be an easy and low-maintenance method to apply nutrients down into the root zone around large evergreen shrubs and trees, like arborvitae. Fertilizer spikes come in many formulations, but as an evergreen, arborvitae will benefit most from a product with a guaranteed analysis of 12-6-12 or 24-8-16 that is designed for evergreens and contains macro- and micro-nutrients. Fertilizer spikes can be more costly to use than granular fertilizer, but many prize them for their convenience and ease of use. Insert fertilizer spikes around your arborvitae twice each year, with the first application in mid-spring and the second in mid-fall. 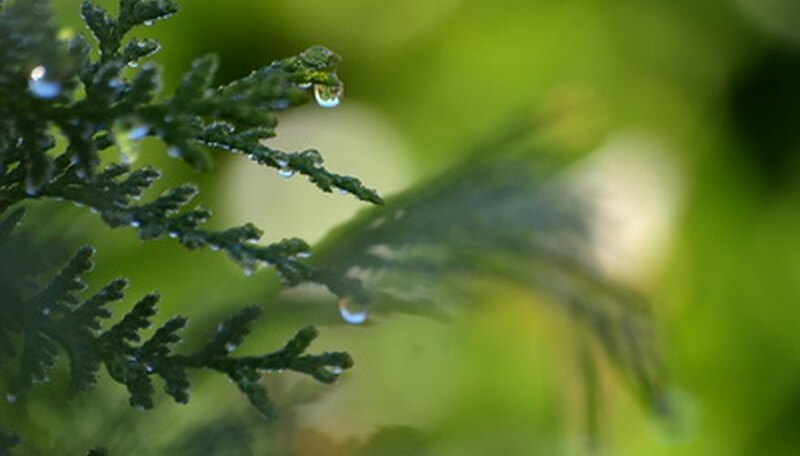 Water the soil surrounding your arborvitae before inserting the spikes, if it is at all dry. Soak the soil until it is drenched with water and softened but not soupy wet. Determine the number of tree spikes needed by consulting the package label and identifying the number of spikes for your size of arborvitae. Lay down the spikes on the soil, along the outer drip line of the canopy, at least 2 feet out from the trunk. Click the plastic cap included in the product package over the top of the fertilizer spike. Insert the pointed tip into the soil surface and pound the spike into the soil with a rubber mallet, striking against the plastic cap until the spike is buried in the soil. Remove the cap and whack the spike until it comes to rest 2 inches below the surface. Place the cap on the next spike and repeat the process until all of the spikes are in the soil. Water your arborvitae as normal thereafter providing a drenching roughly once per week. The water will help move the nutrients through the soil and into the roots.